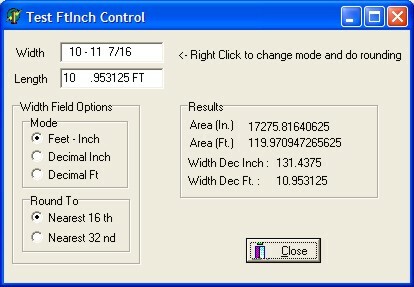 Delphi VCL component for Inputting Feet and Inches (ex. 1 - 1 5/8) and also decimal feet or decimal inches (ex. 120.0625 IN and 10.0 FT). 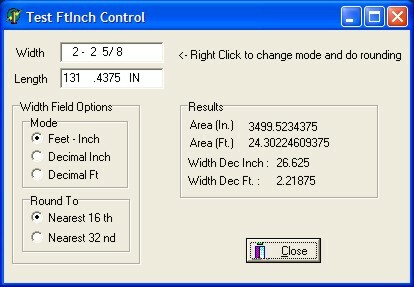 The Width field below shows the TMaskFtInch Control in FtInch Mode and the Length field in Decimal Inch mode. The Width Field Options Shows the available options for the Mode and Round To Properties. The Results shows some examples in the code on how to use the properties. The Width field below shows the TMaskFtInch Control in FtInch Mode and the Length field in Decimal Ft mode. $50 will get you the source code. Please email any questions or suggestions. More Delphi components and code examples will be added in this area as time permits.